Disney's "The Nutcracker and the Four Realms" is a "love letter" from a mother to her daughters encouraging them to embrace who they are and understand their inerrant worth, screenwriter Ashleigh Powell has revealed. "I had two children over the course of making this movie, and this story is a love letter from a mother to her children," Powell told The Christian Post. "It includes a message that I hope my children carry with them, a heartfelt mantra by which they can live their lives." That message, she said, is to "embrace who you are and recognize your incredible worth," adding, "You have everything you need to succeed in life. I think that's something every child needs to hear and remember." The forthcoming fantasy drama, starring Keira Knightley, Mackenzie Foy, Helen Mirren and Morgan Freeman, hits theaters on Friday. The film is based on E.T.A. Hoffman's short story written in 1816 and Alexandre Dumas' retelling in the 1892 Tchaikovsky ballet "The Nutcracker." In Powell's version, 14-year-old Clara is fascinated by engineering and is trying to figure out how to unlock a Christmas gift left behind by her late mother. Clara soon finds herself in a mysterious parallel universe where she encounters a nutcracker called Philip. Together, the two embark on a dangerous search for the key to Clara's gift. Powell told CP she sought to portray Clara as a smart, capable girl determined to overcome numerous obstacles. "We've grown up with the very traditional stories of girls as the 'damsels in distress' or stuck in a tower waiting for a man to save them," she said. "I've always felt strongly that girls need to learn how to be empowered. It's a message I really believe in." With vivid imagery, whimsical costumes, and enchanting music, "The Nutcracker and the Four Realms" pays homage to the beloved original. But while "beautiful, magical, and visually immersive," the ballet plays out like a "fever dream," Powell said, explaining she wanted to bring a more human element to the classic. "It was fun to play in a world that feels nostalgic and familiar and bring news ideas to it," she said. "One of the things I wanted to do with this story was find a strong emotional line for it; I wanted to find a way to bring reality to it." Powell said that one of the challenges she encountered while writing the script was making the "Nutcracker" villain — who in the ballet is described as a "seven-headed mouse creature" — actually scary. "Every time I tried to picture that in my head, I couldn't visualize anything scary," she admitted. "It seemed silly to me, and it wouldn't work onscreen. I had to reimagine, 'what is a way I can take this idea and make it new and exciting? What would be a magical version of that thing?' And I came up with the idea of a bunch of mice who come together to create larger creatures in an abstract form." Seeing her work hit the big screen for the first time was "magical," Powell said. "To see my characters brought to life by the most talented people is mind-boggling and it's inspiring," she said. "There were little details put into the production and set work that were intricate and incredible to see. It's a very immersive experience." 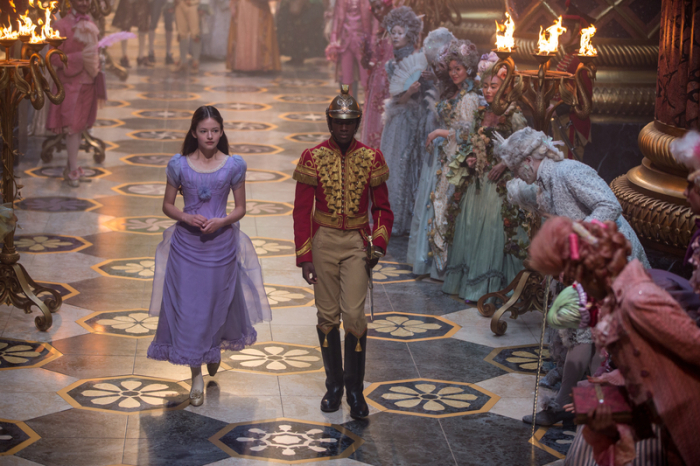 "The Nutcracker and the Four Realms" drives home the idea that good ultimately overcomes evil, making it a "message for everyone" — regardless of their age. "We all grew up with these fairytales," Powell said. "I hope this will inspire children to fall in love with a classic story." "The Nutcracker and the Four Realms" is rated PG and hits theaters on Nov. 2.